A couple years ago, being the best-selling car in the Chrysler lineup might have meant something. 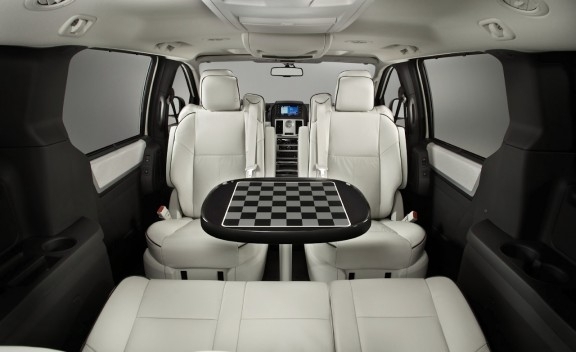 As would the recognition of being one of the best-selling minivans in America. It’s true, the Chrysler Town & Country is a big fish in a small pond now – a vehicle with so many features and good qualities that it deserves a better segment in which to display them all. Still, it marches on, with the T&C outselling all Chrysler products save the Ram. The top-of-the-line Limited carries with it a number of family-friendly concepts that drive minivans sales – like a Stow ‘n Go seating system that allows any and all four seats to fully stow flat into the floor. With a touch of a button you can open and close the sliding doors and rear liftgate too. If convenience makes you sit up and listen, it’s comfort that gets buyers into the van itself. Each seat accommodates a range of adult and kid sizes – even the rear seats have headroom for those six-feet-plus. You’ll have to go digging through the options list for a number of tech features, but despite this it’s clear the Town & Country remains the dwindling minivan market’s star. Auto opening and closing doors are incredibly helpful in the loading and unloading stages, and with seven seats that stow into the floor, the T&C’s interior space is extremely versatile. An optional rearview camera combats visibility issues by giving you a fisheye view to maneuver in and out of parking spaces. The Swivel ‘n Go system enables the middle bucket seats to face the rear for family-style seating. The middle seats don’t fold forward easily enough when allowing for rear passenger access and there are some spots in the contraption that are easy to catch your hand in. The driver has no rear visibility with the TV screens down, and you’ll see a couple of items on the options list that you wish were standard at this price. While minivans are notorious for their awkward and uninspired drives, the one thing we can say is that the Town & Country is insanely comfortable. Body roll is kept to a minimum and the suspension makes it so the car feels as it’s floating along the road – perfect when the kids have finally drifted off to sleep. Seats are generally soft and adaptive to occupants of all shapes and sizes. Unfortunately, the driver will be plagued with vague steering and poor visibility, making the rearview camera a necessity. The 4.0-liter engine has a nice amount of power in the low gears though, and you’ll need it when you have the added weight of five 10-year-olds and all their stuff in the back. 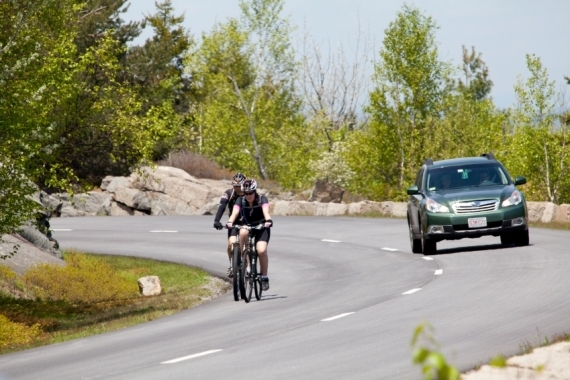 A manual shift mode will come in handy if you’re bored or dealing with hills, but don’t expect it to add any spark to the ride. Town & Country buyers have three engine options, but the Limited is equipped with the largest – a 4.0-liter V-6 that produces 251 horsepower and 259 lb-ft of torque. This particular trim comes equipped with a six-speed automatic transmission with manual shift mode. 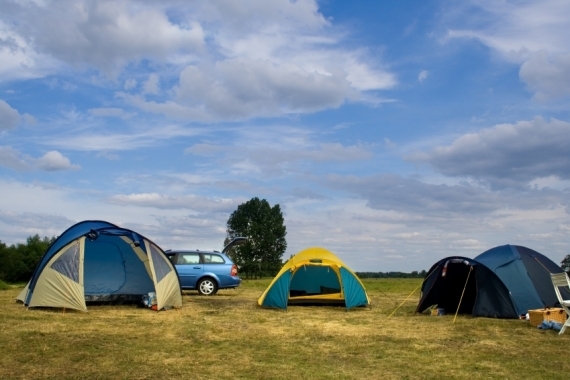 With minivans, the more interesting, timesaving features they can throw in the better. In the Limited’s case, rain-sensing windshield wipers, power stowing rear seats and remote start are just a few things that will keep your focus on the journey. Stow ‘n Go allows you to tuck every rear seat into the floor below, giving the Town & Country 140 cubic inches of cargo space. If that’s not enough, there are storage bins everywhere – in the floor, ceiling and doors. An entertainment package adds the all-important nine-inch overhead DVD screens, two wireless headphones, remote and Sirius Backseat TV. 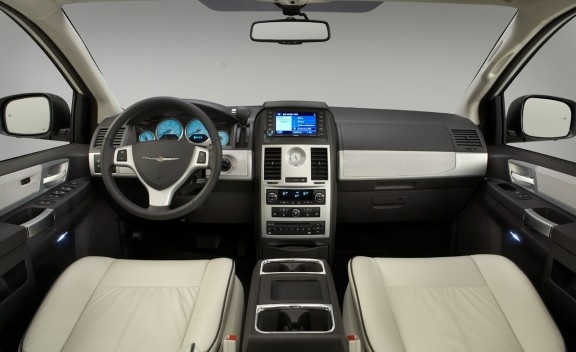 Chrysler’s UConnect navigation system is simple to use and the screen integrates well within the dash. A nine-speaker stereo system with subwoofer is standard on the Limited trim. It’s no wonder the Town & Country doesn’t have great mileage numbers considering an exterior design that’s as aerodynamic as a container ship. Still, the Limited returns 17 mpg city and 25 mpg highway – fairly standard numbers for the segment and the best among the T&C engines. The large gas tank means you’ll drive 400 blissful miles without having to top up. Interior comfort depends on where you’re seated, with the middle seats being surprisingly less comfortable than those in the rear, which have copious amounts of headroom. The center console slides back and contains four cup holders and a large amount of storage. A green-accented instrument panel is nicely laid out, if a little boring. Others in the segment have started streamlining the exterior look, trying to make the minivan look less van-like. Chrysler hasn’t yet adopted that styling (though it should), preferring a more boxy appearance with a prominent grille and chrome emblems. The Limited rides atop 17-inch wheels. 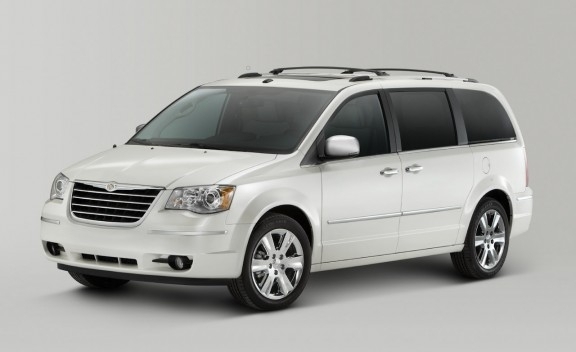 The Town & Country lineup starts at $25,995, but the Limited tops the price list at $35,880. Vying for popularity with the Town & Country Limited are the two other big players in the segment. The Toyota Sienna Limited, all-new for 2010, starts at $38,500 and the Honda Odyssey EX-L, which comes in at $33,405. 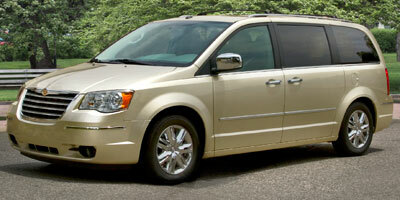 In the land of minivans, the Chrysler Town & Country is king. And it’s no surprise with the array of family-friendly features just waiting to make your day a whole lot easier. The Limited trim gives you the most the T & C has to offer, for a fairly middle-of-the-road price, too. It may need updates to its exterior and tech soon enough, but it can still haul a family around like no other.